Since the summer of 2009, we have been running an mHealth reporting study in Ho Chi Minh City on influenza-like illness (ILI). Over 70 community clinics have participated in this project, and about 53,000 ILI reports have been contributed over the years. You can read about the study set-up and the real-time epidemiological tracking that this network enables in this post. The key new findings in this study are that ILI patterns in Ho Chi Minh City follow a non-annual cycle, and that this non-annual cycle greatly improves forecasting ability. You can read about these results in this bioRxiv preprint. 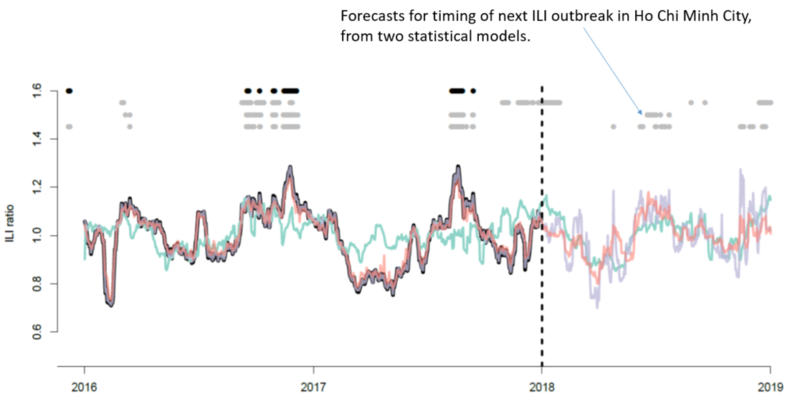 Recently, OUCRU postdoc Matt Graham has been improving the real-time forecasting methods for our ILI network. Below, Matt shows the forecast for the ILI ratio for 2018. The ILI ratio simply tracks the current signal’s percentage above or below the 6-month trailing mean. The signal analyzed is the percentage of patients attending clinics that meet the ILI case definition. The red and violet lines above show the forecasts from a random forest model and a boosted regression tree fit, respectively. The green line shows the forecast from a standard linear regression, but this method has been shown to be much less accurate than the first two. The bottom two series of gray dots show the outbreak timings from random forests and a boosted regression trees. According to these two models, inluenza-like illness activity in Ho Chi Minh City will be in a peak period from June 17 2018 to July 22 2018. The first forecast that we made (internally only) was in early 2016, that the peak period that year would be in September. In 2017, we neglected to make a forecast. Thanks to Matt for all his hard work on this analysis.